I celebrated a birthday this past weekend. Well, two birthdays, actually: mine and America’s. Yep, there we were, me and America, blowing out candles, setting off fireworks, having our cake and eating it, too, pretty much relishing the good life with family and friends — all thanks to the brave men and women who sacrifice their time and sometimes their lives so that I and those I care about can enjoy the freedom to do just what we want to do on this or any other day. Is this a great country or what? Frankly, this year America and I are facing some tough hurdles. What with our nation in a debilitating recession and me without a job or a sense of purpose, our prospects for recovery seem fragmented at best, and very far off in the distance. I can’t speak for America, but sometimes I wonder if I’ll ever renew my independence, my value. Will we ever see any likeness of prosperity again? And on that note, I celebrate. Like most of the people in America this weekend, I had friends and family over for a barbecue/fireworks soiree. We grilled chicken and hot dogs, and washed them down with root beer floats; I made cheesy beer bread, corn on the cob, Ina Garten’s luscious lemon cakes, and our old family favorite: Summer Salad. For me, nothing screams summer like salad fixings fresh from the garden. As the mercury rises, so, too, does my craving for foods that come with descriptions like refreshing, sparkling, cool and crisp — and I’m not talking about the light beer chillin’ in the fridge. Hello there, my juicy red culinary beach ball. 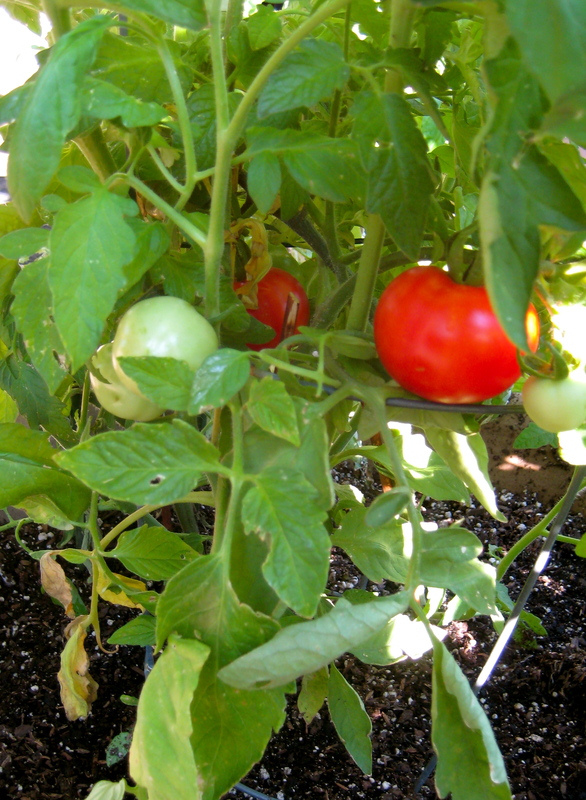 Hallelujah — I’ve got tomatoes! So many recipes, so few tomatoes -- for now. Fresh tomatoes that I grew myself. In a big pot. On my back deck, right where tomatoes like to be, in the bright sunshine and staggering heat of summer afternoons. Just the perfect springboard for Summer Salad. 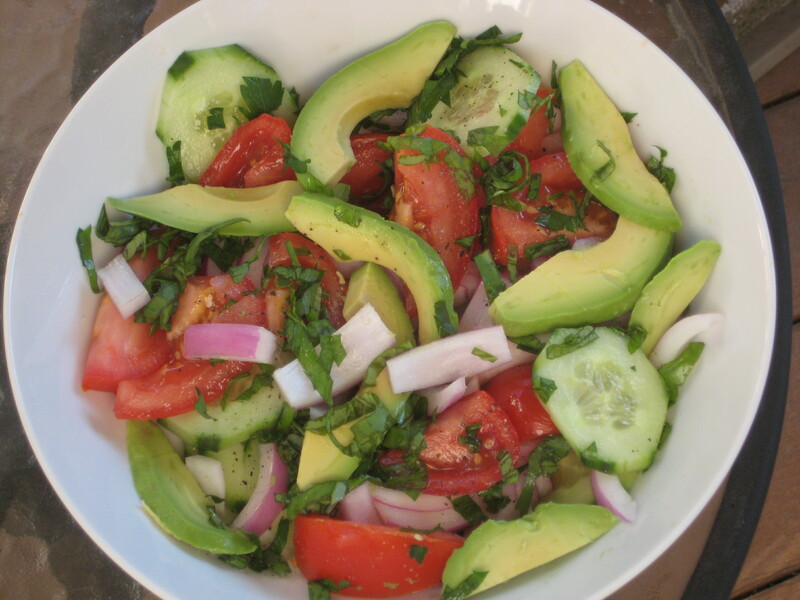 Tomatoes combined with fresh cucumber, avocado and red onion, and dressed simply in a red wine vinaigrette with snipped fresh herbs — this was our family go-to salad during the hot summer months when meat sizzled on the grill as bare feet sizzled on the sidewalk. Summer Salad is a welcome change from just another boring lettuce salad (although the world of salads has developed so much over the last several years, but that’s a blog post for another time). And the familiar blend of flavor and freshness takes me back to a time of greater prosperity, giving me hope for a season of renewal. Summer Salad ready for dressing. Summer Salad ready for serving. Combine tomato, cucumber, onion and avocado in a large serving bowl; sprinkle with the fresh herbs and red wine vinegar; add salt and pepper to taste, and refrigerate for about one hour. Just before serving, carefully stir in desired amount of sour cream, making sure to coat all the ingredients. A refreshingly cool twist to lettuce salad — try it with grilled burgers! 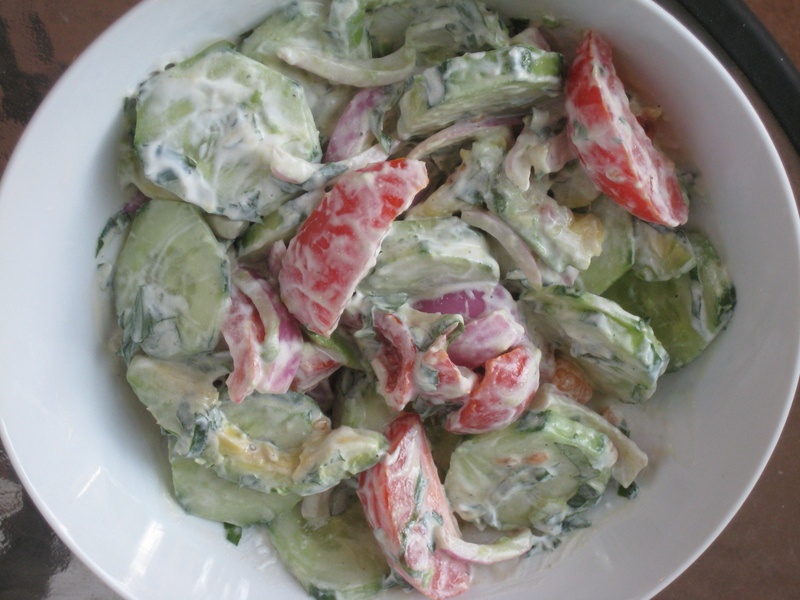 This entry was posted in Salads and tagged avocado, cucumber, Salad, sour cream, summer, tomatoes. Bookmark the permalink. Yummy!! The photo looks great! The one thing I would do with it is use a small mirror or white reflector to put a little bit more light on the tomato and cucumber in the foreground. Nice work! Great suggestion — thanks! And thanks for visiting.